Its sleek, modern handsome design and attractive colors suit the COMBO COMPACT to the smartest surroundings. Constructed of hi-impact polystyrene and covered with heavy vinyl, this unique electronic instrument is practically impervious to mars, cracks, or scratches. Set up for use, the COMBO COMPACT is 38″ long, 18″ wide and 51″ high. The entire unit folds easily into a single carrying case that weighs just 70 pounds. The legs fold into the bottom of the keyboard console. Storage space for the swell pedal and the 13-note pedalboard (optional extra) is contained in the lid. The swinging rhythm and driving beat of today’s music make the new electronic COMBO COMPACT a “natural” for young groups who play this modern sound. Its unique Multi-Tone Booster gives tremendous attack and “edge” by boosting the upper frequencies, highly desirable in arrangements popular with many young groups. The COMBO COMPACT is the modern sound for which they are looking! However, the fully polyphonic COMBO COMPACT is a versatile keyboard instrument suited to a wide range of professional expression. Its 12-note Manual Bass enables the player to obtain authentic organ pedal sounds without using the footpedals. Full organ pedal sounds are produced with the 13-note pedalboard, an optional extra. 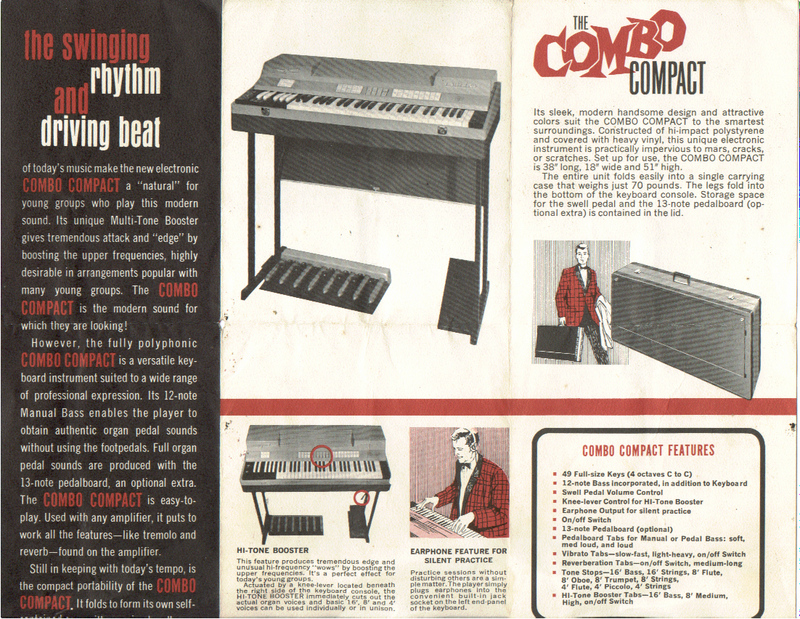 The COMBO COMPACT is easy-to-play. Used with an amplifier, it puts to work all the features – like tremolo and reverb – found on the amplifier. This feature produces tremendous edge and unusual hi-frequency “wows” by boosting the upper frequencies. It’s a perfect for today’s younger groups. Actuated by a knee-lever located beneath the right side of the keyboard console, the HI-TONE BOOSTER immediately cuts out the actual organ voices and basic 16′, 8′, and 4′ voices can be used individually or in unison. Practice sessions without disturbing others are a simple matter. The player simply plugs earphones into the convenient built-in jack socket on the left end panel of the keyboard.